It is easy to assume that following a diabetic friendly diet would be overly restrictive, and that most of the foods you enjoy are completely off limits. It is true that you have to be careful about what you eat and that there are restrictions and limitations, but you can still enjoy many of the foods that you love. In truth, most people should be monitoring their diet anyway, you just have more incentive. There is an idea that diabetics cannot eat fruit, for example, but this is not true. You can eat fruit, but in order to do so safely, there are some rules to follow. Fruit is a healthy and delicious food that is full of natural sugars. These sugars are not as harmful as added sugars or even the sugars from broken down simple carbohydrates, but they do still affect your blood glucose levels. This means that you need to be a little careful, but you can still enjoy the delicious sweetness of fruits. When it comes to eating fruit, you are better off choosing all natural, fresh versions rather than canned. Canned fruit is often packed with added sugars, syrups, preservatives, and more. Since fruit is already sweet, you really don’t need all that extra sugar. Frozen is an acceptable alternative to fresh fruit, but be aware that many dried fruits can have added sugars and pack more carbohydrates into smaller servings. Fruit does have natural sugars and carbohydrates, so it is a good idea to balance out your fruit portions with fiber and protein. For example, eat your fruit with some yogurt, whole grain granola, or some peanut butter. This will help you balance out the sugar and carbohydrates in the fruit so your blood glucose levels can remain stable. Bear in mind that fruit is naturally sweet, and so you don’t need to add anything extra. It is a common practice to sprinkle sugar over fresh berries, or to salt apples and cantaloupe. To keep your snack as healthy as possible, skip these steps and just enjoy the simple sweetness that fruit offers. Some fruits are better than others for diabetics. Berries, for example, have the most antioxidants and pack a whole lot of nutrition in each tiny bite. Apples have fiber to help balance out the sugars. As with everything, fruit should be eaten in moderation. You do not want to go overboard and eat too much because fruit does raise your blood sugars. Monitoring your serving sizes will help you to enjoy your sweet treat without hurting your blood sugar. 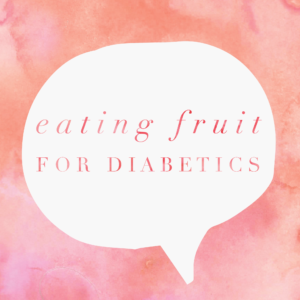 Fruit can be a healthy and delicious part of your diabetic friendly diet. You simply need to follow these rules so you can get the most out of your sweet snacks. For more information about diabetes, click here.